After clinging far too long to my trusted Motorola Moto G (1st generation) smartphone, I made the decision to buy a new phone a while ago. What I wanted was simple: A form factor of 5" or smaller, hardware upgrades across the board, at least 32 Gigabyte of storage space, and a high resolution display. Most phones these days seem to come in extra large only and while that is useful to some, I always disliked those devices as they were less comfortable to carry around or use. I had high hopes for the Nexus 5x but its shortcomings and price made me look for alternatives. Then I found out about the Xiaomi Mi4c and made the decision to give it a try. The device is available in two flavors: a 2GB RAM / 16GB storage version, and one that has 3GB RAM and 32 Gigabyte of storage. I decided to get the latter as I wanted the extra space and more RAM, and since it is only $50 more, it is definitely worth it in my opinion. The Xiaomi Mi4c is only available in China at the time of writing. It is possible to acquire it through retailers outside China though. I bought it from Xiaomi Device for $279.99 plus tax. Depending on where you live, you may want to try other retailers to avoid the added tax by selecting one that does not ship it from China but from a location nearby. Giztop for instance delivers the phone without extra charges, but it costs $299.99 there. The device itself is unlocked when you purchase it, and the only thing you need to do before making a buying decision is to check the bands supported to make sure they are what you need carrier-wise. The smartphone is available in black, white, blue, yellow and pink, and ships with a USB Type-C charging cable. I don't really care how a phone looks as long as it handles every task I throw at it. The phone looks like many other Xiaomi devices and you may find it a bit bland when you look at it but for the price point it is available at, it is quite nice looking. The device has a full-plastic casing and non-removable back cover. This means that you cannot replace the battery which can be problematic in a year or two depending on usage. The top features a microphone connector and infrared port and the bottom the USB Type-C port. You find the dual sim slot on the left of the phone, and the volume and power buttons on the right side. The back is home to the phone's speakers which you find at the bottom there, the camera lens and the flash. The phone is light, at 132g, and feels smooth to the touch. The Xiaomi Mi4c features a full HD display with a pixel density of 441 ppi. The quality of the display is excellent, especially so if you consider that this is not a flagship phone but a mid-price phone. Colors and viewing angles are great, and it works superbly outdoors as well. The touch display is very responsive and there is nothing bad to say about it or the display. The phone is powered by the MIUI 7 interface running on Android 5.1.1. 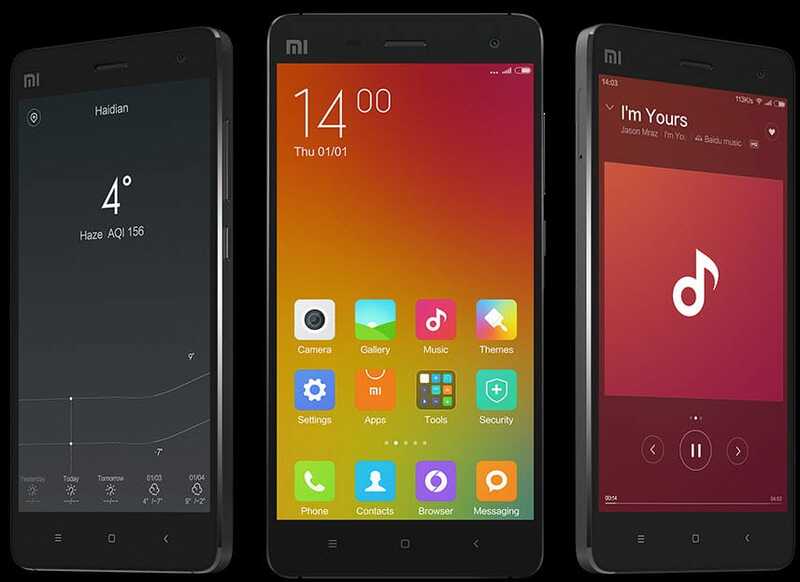 It ships with a bunch of Xiaomi applications like the company's application store or updater. Most of those are in English when you run them while some are not. The store for instance is mostly in Chinese, and while you can find many apps in it that will display in English once installed, it is likely not the case for all of them. This leaves you with finding a way to install Google Play on the device to grab your apps from the official store, or to use third-party sources like APK Mirror instead for apps not offered in the MI Store. 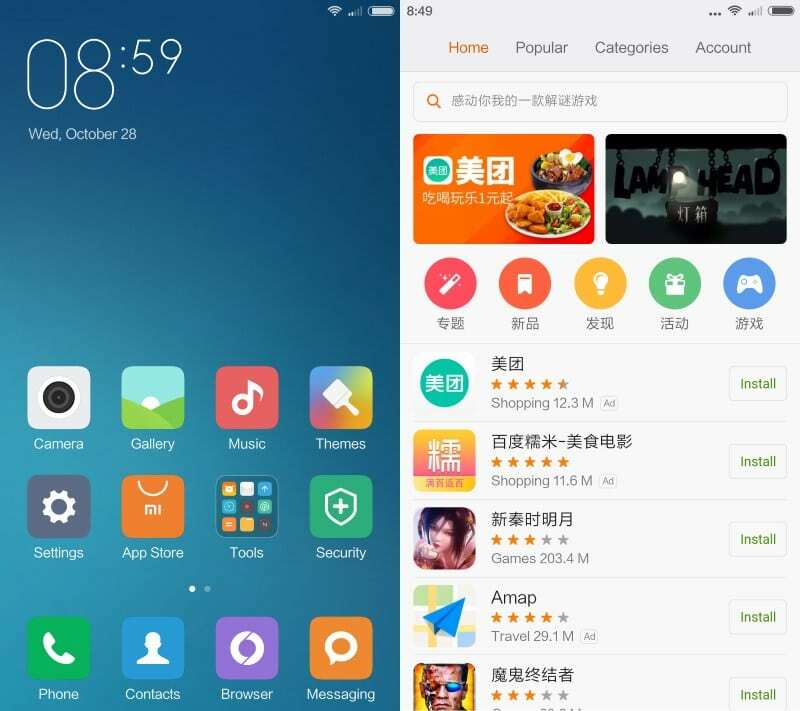 If you have used a stock Android device previously, you will have to spend some time getting to know the MIUI interface. Notable differences include the Updater application which you use to update the phone and a Security app that controls the devices's security settings. I made the decision to root the phone right away by installing a developer rom on it. This required no extra tools and prepares the phone for custom modifications that you can install on it. The software that runs on the device and the interface itself is very responsive. Everything is fluid and fast, and you will notice no delay when opening apps or flipping between screens. A handful of features are unique to the device. One of them is called Edge Controls. It enables you to tap with a finger or thumb on the left or right side of the device to run actions. If you are in the camera application for instance, a photo is automatically taken when you do so. There is also a double-tab option to go back and a couple of other nice to have features like double-tapping on the screen to wake up the phone. The performance of the device is excellent. It is responsive and fast. 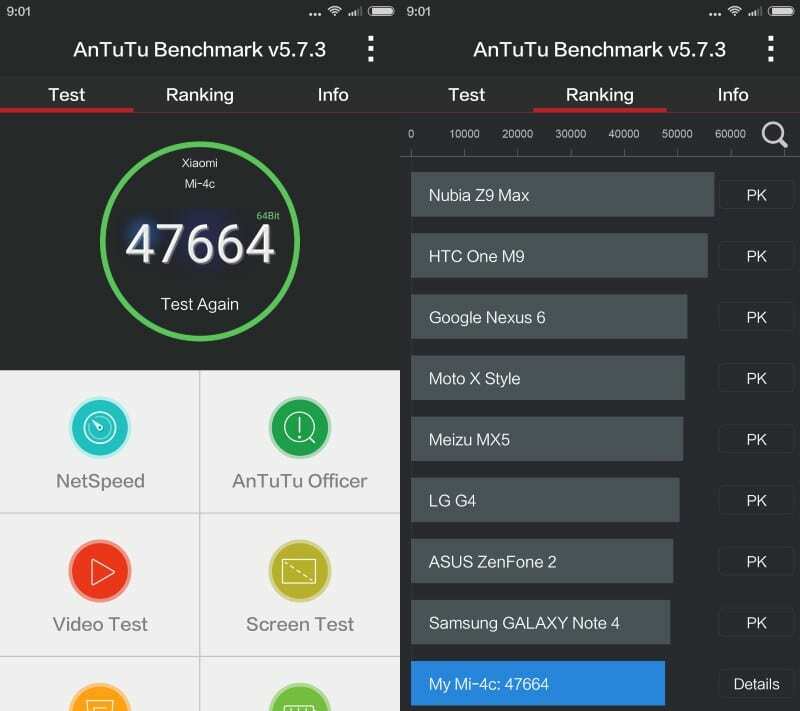 A quick AnTuTu Benchmark test revealed a score around the 47k mark which puts it in Samsung Galaxy Note 4 territory. Yes, there are faster phones out there but they tend to cost hundreds of Dollars more. I don't play games on phones and cannot really say how well it performs in this area, but would suspect it to do quite well there too. The battery lasts a good day even if you use the phone throughout the day, and the fast charging capabilities allow you to push the level to 40% in about an hour. Connectivity is another area where the Xiaomi Mi4c performs really well. Regardless of whether it is WiFi or LTE, it is always stable and fast, and I never encountered any issues while being connected. To make it short: the front-facing camera of the Xiaomi Mi4c is excellent and while results may not be as impressive as that of the Samsung Galaxy S6, they do come close and are exceptional for a mid-range phone. Audio quality when using headphones is great, but the speaker has a few issues especially at higher volumes. You may need a different charger depending on your location. The phone ships without Google Play or Google apps. The phone uses a Chinese / English keyboard by default. The English MIUI forum is a good place for troubleshooting and tips. The Xiaomi Mi4c is a powerful device at the price point it is offered in. Price, hardware, performance, display, battery and camera are big selling points for the device and outperform many same-priced and even some higher-priced devices. There are only a few negative points, including the audio speakers, the missing micro SD card slot and the non-removable battery. Lastly, there are some things that you can work around, like the missing Google Play application or certain apps that are only available in Chinese at this point in time. A detailed review of Xiaomi's new Mi4c smartphone. Add this to your Specs. I have added the second option, thanks! Some Xiaomi devices like Mi3 which have internal battery can be upgraded at Xiaomi Service center. Not sure about Mi4c since its not available in India so can’t comment on its repair-ability. Internal battery is not a death kneel in 2 years time. This is one of the great things about Xiaomi and certain other new Chinese mobile manufacturers, the spares are easy to get and cheap. But for unofficial markets its a problem indeed. What about 3rd party ROM availability? Any observations? I have not looked into this really yet. I noticed an unofficial CyanogenMod and an unofficial International ROM. There is probably more but I have yet to look at what is being offered. I heard there is no fm radio in the MI 4c? Is it true? The Chinese version has local FM Radio, the international version nothing as far as I know. Hey Martin, Excuse my ignorance, but would not one of the apps that are meant for a specific FM radio station work? Or even something like alldownloadapk.com/download-1-fm-online-radio-official-app-1-51-apk/ Though I haven’t tried this generic one. Only the app that allows you to connect to a specific station. I ordered this phone 3/32 at gearbest.it comes with Google apps installed. I did a factory resed, but the apps is still there. Probably I have modified room, or … Fake phone, since I can’t run the xiaomi verification application on it.